Marrakesh, in the African country of Morocco, is one of the most unique places on earth – a juxtaposition of modern/historic surroundings set against the dizzying backdrop of the snow-peaked Atlas mountains. Although it’s located just a 3-hour plane ride away from the UK, this bright, bold, and busy city feels like an entirely different world. So it’s no surprise it’s become a popular tourist destination, attracting visitors from all around the globe. The medina is the older part of the city, walled in from the rest of Marrakesh. It’s a busy, bustling place – full of narrow alleys and cobbled streets. Stay there and at every turn, you’ll see market sellers auctioning off their wares, and locals on motorbikes dashing to the next location. It’s hectic, loud, and crazy – but it’s likely to be unlike anywhere you’ll have ever been before. Also – never be afraid to haggle, but always pay what you think an item is worth. Don’t ask for a lower price simply because you want to pay less. After all, the souks are a livelihood for many Moroccans. When you fancy heading out of the medina and into the newer part of the city, one of the first stops on your list should be the Yves Saint Laurent museum. The most modern museum in the area, it’s – of course – dedicated to the life and works of the late fashion designer, who spent much of his down time at his villa in Marrakesh. Like most museums, it can get pretty busy here in high season, but not so hectic that you can’t queue for a ticket. Plan your trip here well during your holiday, as the place is closed on Wednesdays, and only open for reduced hours during the month of Ramadan. Just down the road from the YSL museum is the stunning Jardin Majorelle, one of the most popular tourist sites in Morocco. This historic garden, built by Jacques Majorelle, is super busy all year round, so you’ll want to book a ticket before you go – either before you fly or at your hotel. The enchanting, two and a half acre botanical oasis is a bubble of calm in the city, and often has queues around the block, with customers clamouring to see the fountains, pools, palm trees and varied flora and fauna that make up the garden. And for those who tire of the wildlife, there’s also a bookshop and café, where you can while away a few hours before heading back outside. For another dive into the rich history of Morocco, pay a visit to the tombs of the Saadian dynasty, dating back to sultan Ahmad al-Mansur, from his death in 1603. Restored in 1917, the tombs are one of the most popular attractions in Marrakesh so be warned – it can get very busy during popular tourist times, with long queues to get in. We’d advise getting there as early as possible (it opens at 8am). Marrakesh is famous for its stunning rooftop spots, where you can enjoy in a mint tea and watch the sun set over the city. 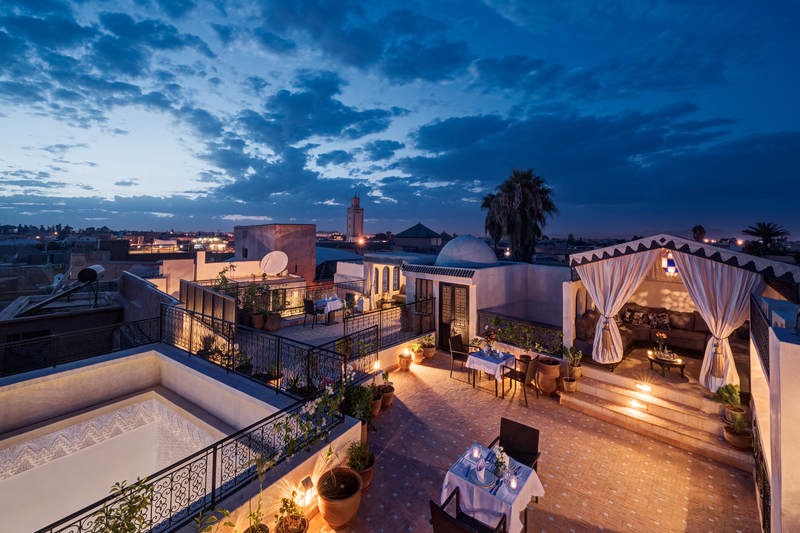 The rooftop of the Riad Star in the Medina is one of the most atmospheric, providing incredible views of Marrakesh as far as the eye can see, it’s the ideal place to unwind and drink in this exciting city. A hidden gem in the midst of the medina, this was a personal highlight for us. You’ll pay just 50 dirhams to get in – around £10 – and can generally avoid a queue, as there is a continuous stream of people are going in and out. And once you’re in, you won’t believe the medina is outside waiting, because the place is such a haven. Having recently undergone a renovation, visitors can expect a stunning garden full of water features, exotic plants and bushes, and birds tweeting from a height. There’s also a room with an extensive history of the garden, translated into English too, which is quite rare in the city. Take a moment to relax on one of the benches while you’re there – you’ll have never felt more zen. Jemaa al-Fnaa is the main square/market-place in Marrakech, and is always busy, full of eager tourists ready to catch a bargain. It’s huge, and during the day you can expect almost anything there from snake-charmers (yes, really) to bag-sellers. However, the market changes as the night draws in, when magicians and food stalls pop up for the evenings entertainment – so it’s well worth a visit at both times of day. However, again, expect it to be hectic! If you want to step outside the medina, the Gueliz district will give you a taste of a very different pace of Moroccan life. There’s plenty of shopping to be done, whether an upmarket – yet very Moroccan – art gallery is for you, or you simply fancy spending some of your dirham in Zara. There’s also the popular Arsat Moulay Abdeslam Cyber Park, a glorious green vista offering that always-vital Wi-Fi, if you’re struggling without an internet connection. Visitors can also expect stylish bars and wickedly tasty restaurants serving a range of world cuisines. You’ll certainly want a break from the busy Medina sooner or later, which is where the Riad Star comes in. A 3-star hotel, the Riad Star is tucked down an inconspicuous side street where, at the entrance, locals can be seen burning wood. It’s no exaggeration to say that the Riad is an enchanting oasis from the second you step in the door. While it is steeped in an intriguing history – as the old home of Jazz legend Josephine Baker – it’s also rich with modern comforts, including a state of the art kitchen, air conditioning, and gorgeously ornate decor. Marrakech can often feel overwhelming. But the staff at the Riad Star are the perfect balm; they really can’t do enough for you. Need a taxi booked? No problem. Want a mint tea delivered to your sofa on the terrace? Sure thing. If you want a home from home on holiday, there’s no question that this is the place to be. Held at the middle of the stunning hotel is one of the main attractions – a crystal clear plunge pool, creating an atmosphere of calm at a parallel to the outside world and just the remedy after a busy day of walking around the city. 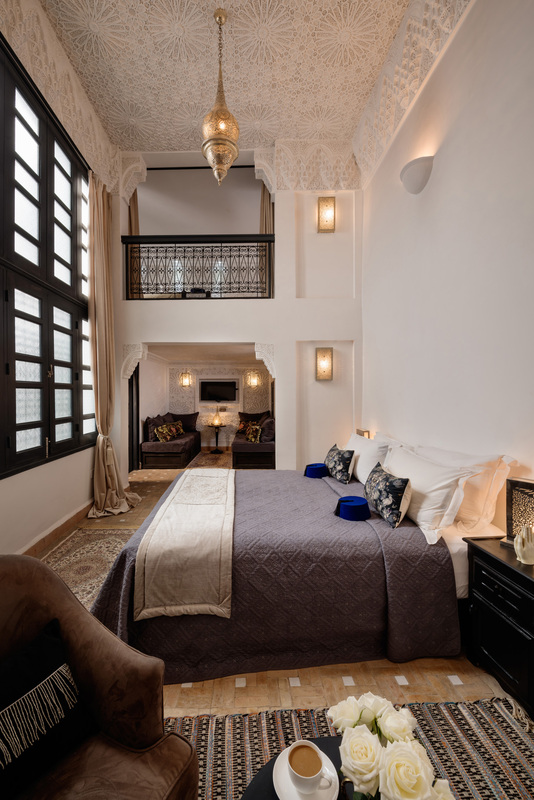 Choose from 13 rooms at the Riad Star – ranging from the enormous and stunning Grace room, to the family suite – the Ebony room – which sleeps six. Or, for a more cosy couple experience, opt for the Charleston room – where W&H stayed on their visit. Each one is as impressive as it comfortable, with big, luxurious beds and cool floors to help escape the heat. The perfect place for a pre-dinner snooze! Rooms are also stocked with everything you might need for a comfortable stay, including slippers, some traditional Moroccan robes, a handy sewing kit, hairdryer, and a minibar, of course. A stay at the Riad Star won’t break the bank – meaning you can get the 5* star experience without the accompanying price tag. A night at the hotel is available for around £89 in July, or around £144 per night in November. You can book your stay here. When you need to wind down from an afternoon exploring the souks, the spa at the Riad Star will also be a welcome sight for you. Opt for the traditional hammam message (200 dirhams), which will see the hotel’s resident masseuse vigorously scrub the grime and dry dead skin off your body (warning: prepare to strip down), before a hot water wash to soothe your soul. Trust me – you’ll come out of the treatment room glowing and with skin like a baby. 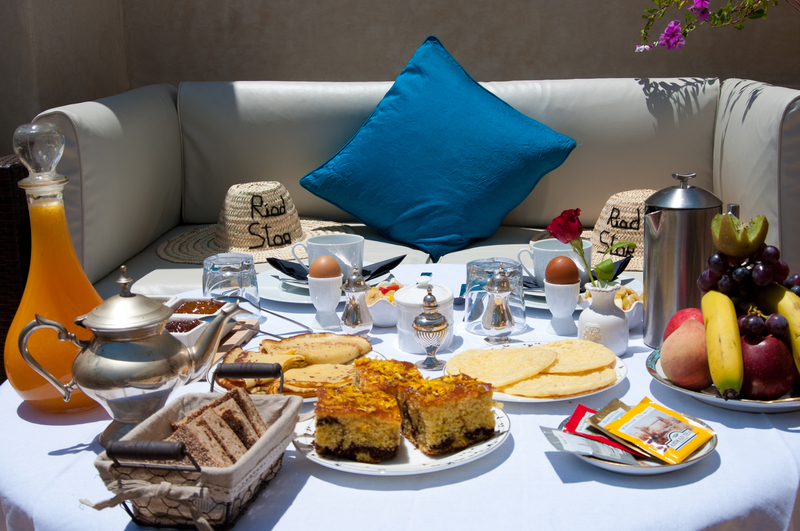 But perhaps one of the best parts of staying at the Riad Star is the fresh, local cuisine served up for breakfast, lunch and dinner. Breakfast is included in the cost of the room, and is as authentic as they come. Expect bowls of deliciously sweet fruit, eggs cooked to order, and a selection of condiments alongside a delicious, homemade Khobz, one of Morocco’s most popular (and deliciously fluffy) types of baked bread. Wash it all down with a tasty mint tea (hint – add a cube of sugar), and you’ll be good to go. Once breakfast is out of the way and you’re ready to explore, the hotel provides a free app, named the MarrakechRiad, which is an invaluable tool when finding your way around the busy city. 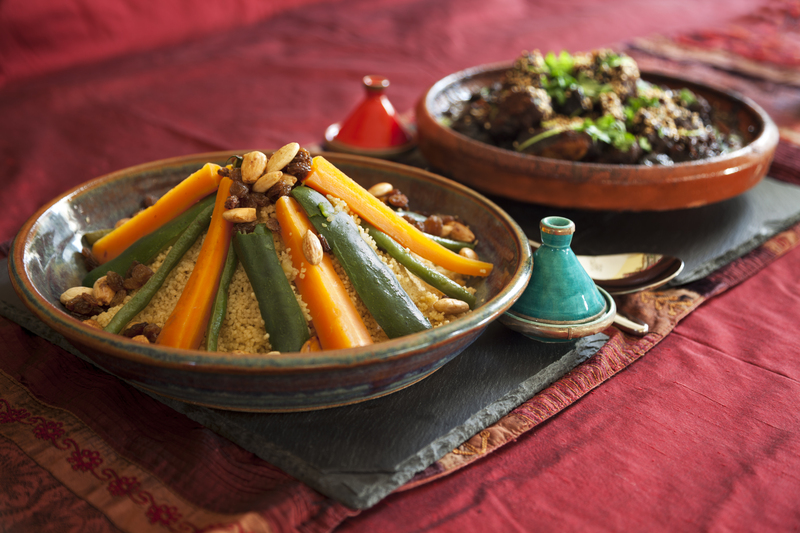 And if, like us, you find yourself desperate to recreate the delicious meals you sampled on your trip after you’ve returned home, you’ll also be delighted to know that the owners of the Riad Star, Mike and Lucie Wood, have created a cookbook made up of the most authentic Moroccan dishes around. Our particular favourites were the courgette salad and aubergine zalouk. You can buy it here. If you’re looking for real, five star luxury on your trip to Marrakesh, look no further than the Four Seasons. Situated in the modern, fun and lively area of Hivernage, this hotel offers a real escape from the outside world. It includes 40 acres of gorgeous gardens and pools for you to unwind in, as well as stunning Moroccan spa, luxury rooms, and an enchanting, uninterrupted view of the Atlas Mountains from many of the rooms. You can book your stay here. Another stunning, 5 star establishment, the Royal Mansour is set in the heart of the medina, and it’s a little different to your typical hotel. The Royal Mansour is made up of 53 private residences. But it isn’t your typical high-rise hotel. All of the residences are hidden within multiple riads; five different ones in fact, spanning from the more affordable Superior Riad, to the creme de la creme, the Grand Riad. And it isn’t your ordinary hotel room either. In fact, you’ll have your own riad to yourself, complete with pools and multiples rooms. One of the most expensive, for example, will see you enjoy a private elevator, a roof terrace, professional kitchen and private dining room. You can book your stay here. A more affordable option is the Savoy Le Grand Hotel. It can also be found in the Hivernage quarter, and comes complete with an enormous outdoor pool, fabulous views, a spa, and any other modern amenities you can dream of – including a hairdresser! Most of Marrakesh’s most famous tourist sites are within two miles of the Savoy too, so you won’t have far to go if you can drag yourself from the sun-lounger. You can book your stay here. Marrakesh restaurants: which are the best? If you’re heading to Marrakesh, look forward to some culinary delights. Of course, the main food offered in the area makes uses of the country’s local resources; there will be plenty of tagines – both meat and veggie – cous cous dishes, vegetarian side dishes, fruit, and mint tea. If you’re in the Medina, expect many of your dishes to be whipped up from produce from the markets – making it fresh, local and delicious. And there are plenty of eatery options to choose from on almost every corner, so you won’t go far wrong with any you decide on. But if you’re looking for some recommendations, just minutes from Jemaa el-Fnaa sit the tranquil and elegantly decorated La Famille, which offers totally fresh veggie and vegan meals. Reserve a table ahead of time if you want to make sure you get in, as it’s often booked up. You can also sample some local cuisine in the Jemaa el-Fnaa, where there’s plenty of grilled dishes to choose from. But if you’re on the hunt for something more upmarket, you can’t go wrong with The Restaurant at the 5-star hotel Le Maison Arabe. A fine dining experience, you’ll want a seat outside around the glimmering pool. Expect traditional French, Arabic and Moroccan food. However, if you reach a point where you’ve had your fill of tagines and salad, there are places to go for a different kind of cuisine. Pepe Nero in the medina is a pricey option, but offers delicious Italian food including fettucine alfredo, seafood linguine or a tasty chocolate pudding. Le Trou au Mur is also a personal recommendation. Hidden down a back alley in the medina, it’s ideal if you want a little something to remind you of home. As well as tagines and Moroccan salads, you’ll also find delicious macaroni and cheese, chicken curry, fish and chips, and shepherds pie – and the food, and impeccable service, is second to none. If you’re in Gueliz, the place to be is Grand Café de la Poste. Behind the main post office in the newer part of Marrkech, the restaurant is slightly more expensive, but worth it for the exquisite décor, delicious wine, and an excellent steak tartare. 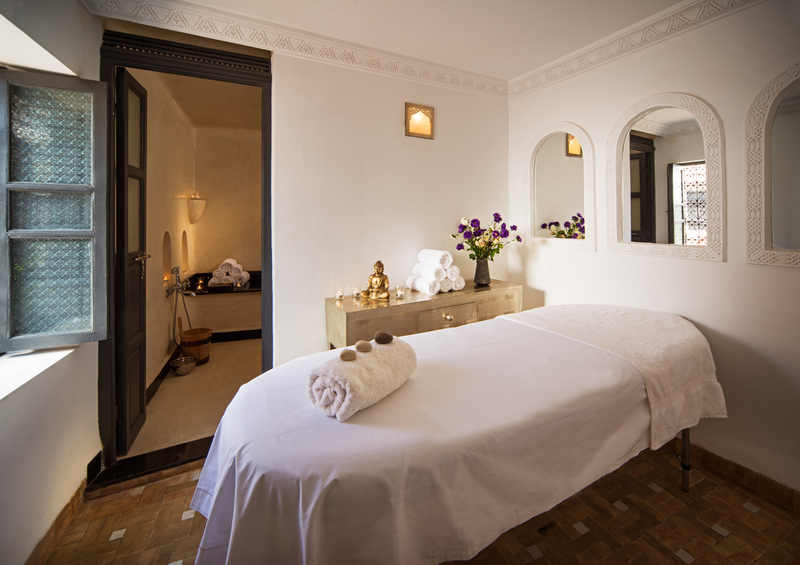 At the heart of Moroccan culture is the concept of relaxation and wellness, lead by their signature hammam massage. There are plenty Marrakesh retreats around, there to help you have a calm, serene holiday. 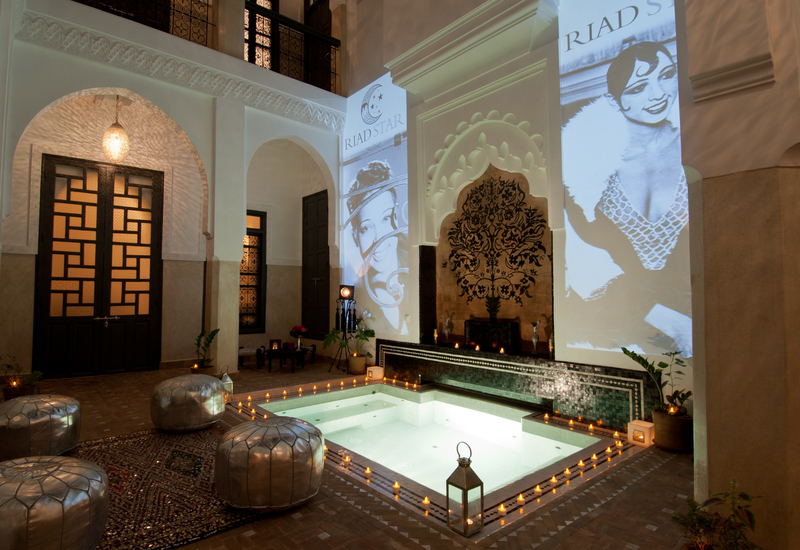 In:spa retreats offers a range of fitness and relaxation holidays in Marrakesh, at their 16-room boutique hotel, located on 30 minutes from the bustling medina. Expect days full of fitness training, green smoothies, resorative yoga and nutrition consultations – be prepared to come back your healthiest self. The Peacock Pavilions, another boutique hotel on the outskirts of the city, offers an ideal retreat for yoga lovers too, with a range of events and teachers on hand to guide you. You can book here. When is the best time to visit Marrakesh? Like all African countries, Morocco can get extremely hot in summer between May and August, with temperatures reaching up to around 37 degrees. Walking in that heat can be tricky, so if you want a more comfortable experience, we’d recommend a stay in October/November, or, January/February/March time. In those months, the temperature is usually around a much more manageable 25 degrees – perfect for walking without a jacket, and without getting too hot.